Why Capability Catalog is important. A capability is a collection of important information that helps users understand how something works in your Salesforce Organization. 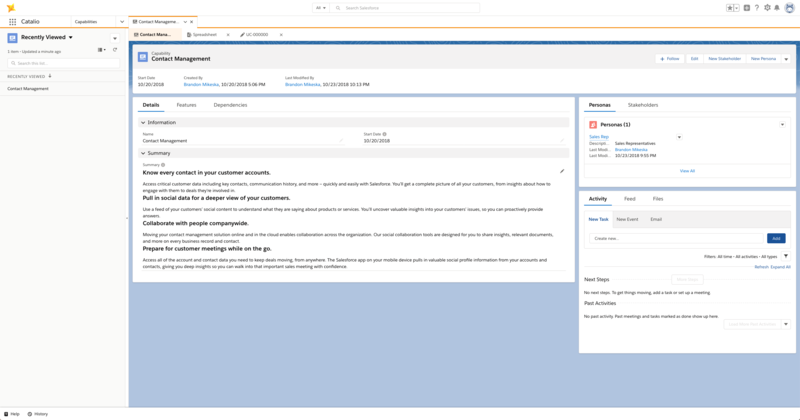 For example, how does your company use Salesforce to manage their associates sales pipeline? How do agents manage Cases to support your customers? Which components, objects, processes, and fields are used and why? Capabilities themselves help you describe to your current team, or even future members of your team on how or why specific objects and automation exist to provide a functionality. Why does this process builder update a custom field on your account? Why does the merchandising profile have a different page layout than everyone else? Ever forget how something was built? A capability allows you to group similar features together that can provide a clear understanding why things were created, allowing for everyone to be on the same page. Need to ask or get additional information? Capabilities allow you to define all the important stakeholders, personas, features, use cases, and dependencies so that you can get a 360 view on how each capability was built, being built, or being planned.